After Keysoe there was time for one really good training session before the Royal International Horse Show at Hickstead. The Royal International is a really long week as qualifiers for the main ring start on Tuesday and although the National classes finish on Saturday the show itself doesn’t finish until Sunday. I had a reasonably relaxed start on Tuesday with no early classes. Biscuit jumped in the last Winter Novice Qualifier which is a 1.10/1.15 A10 class and certainly didn’t look too big compared with what she had been jumping. 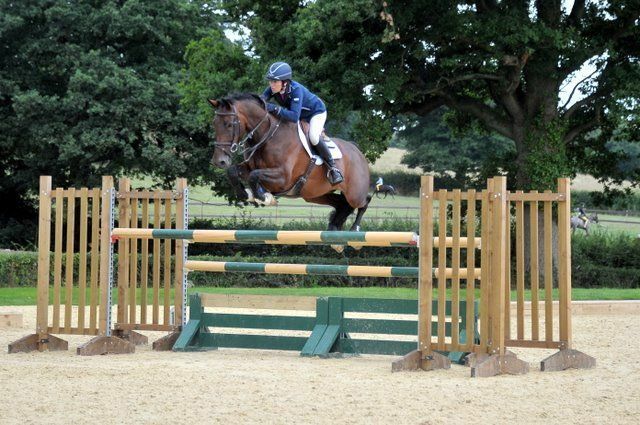 She jumped with great gusto but sadly had the second last fence down ending her chances of making her main ring debut. Emma jumped in the Foxhunter and struggled a little bit with the wet going. Being very careful she likes to give a big push with her front legs and I could feel the turf moving as she pushed making her a little tentative for the first few fences. She gained confidence as the round progressed, but sadly had the third fence down behind. Ferro jumped in the 1.25 in the fantastic new all weather Ring 4 and had a fence in the jump-off. However, we were already ahead of my performance at the Derby Show as I hadn’t fallen off on day one. Wednesday started with Ferro in the 1.25 in Ring Two where she jumped confidently and well, but had one down. I then had a fairly long wait for Emma and Biscuit to jump the Foxhunter in Ring 4. Both jumped very well, Emma going double clear and Biscuit having one fence in the jump-off but feeling full of confidence and jump. On Thursday it was Biscuit’s turn for a double clear and a prize in the Foxhunter in Ring 2, and letting Emma take out a stride in the jump-off meant that I failed to get her properly organised for the following fence! Ferro jumped another good 1.25 round in Ring 2 with a slight senior moment from the jockey when I thought the jump-off started earlier than it did and unnecessarily jumped the last fence in the first round at an angle and had it down. However, we made a marvelous job of the real jump-off as I thought the bell for me to stop was the bell for the ring next door to start! I spent a lovely afternoon watching Shane and Sarah Knight’s lovely Zarnita win the Queen Elizabeth II Cup. Five horses made it through to the jump-off, they all jumped clear with each going faster than the one before. Zarnita went so fast she was literally leaning over on the corners. How exciting to be sitting next to Sarah and to share someone’s really special moment. So much goes into such a win, Sarah found and produced Zarnita before handing the reins to Shane when she was six. She has already had some very good results leading up to this big one, and hopefully there are even more thrilling days to come.On Friday Ferro was supposed to jump in the Foxhunter Second Round in Ring Two, having had a really good warm up by previously jumping two classes in the ring. I got up at 5.00, got to Hickstead at 7.15 walked the course, which was great and the going was perfect and then started studding up. While I was studding up there was the most dramatic thunder storm, and torrential rain, so that the ground became very wet and slippery. Having had three really good rounds and hoping to have a few more adventures before the end of the season it seemed silly to jump her on ground that wouldn’t suit her that well. Out came the studs and I exercised her in the warm-up arena before taking her home - perhaps not entirely worth getting up quite so early. Saturday was another early morning as Biscuit was jumping a 1.20 qualifier for the next Hickstead show and Emma supposedly the 6 & 7 year old qualifier. Emma had caught herself with a stud on Thursday and what hadn’t seemed more than a scratch on Thursday was certainly very sore on Saturday morning. Biscuit jumped a fabulous double clear, but the ground was very wet and so I didn’t hurry her – she will have two more chances to qualify in September. Although my Hickstead winnings were pitiful I was really pleased with the way the horses jumped, and on the whole minor mistakes from me caused their little mistakes. It is always good to catch up with Malcolm Pyrah who I was lucky enough to work with at Old Lodge. He is kind enough to watch most of my rounds and make perceptive and helpful comments, and I certainly think his help contributed to Biscuit’s Foxhunter rosette. Keeping the lid on my own excitement in jump-offs seems to be one of my downfalls, together with the confusion between speed and impulsion that seems to have lasted at least forty years!Sunday was my first chance to ride Homer for a whole week, luckily he is so well mannered, and just loves going for a ride. I then took Biscuit back to Hickstead to be tried by some American clients, who tried her and a Breen horse. AnnaBelle who is 5ft and weighs just 5 stone rode both horses absolutely beautifully, so we have to wait and see what her trainer thinks of the videos. It would be sad to see Biscuit go, but she is now so confident and being placed so consistently in 1.20′s and Foxhunters that she is ready for someone else to enjoy. We have had a more relaxing week. Hacking out at the start of the week, progressing to making sure all the buttons are back on the flat work and finishing with a few jumping exercises today. Homer is feeling really good and doing a fair bit of trotting now – he is probably ready for a bit of schooling now – I’m not sure that he will be as keen on that as he is on his hacking. He has now had the full beauty parlour treatment and looks really smart. In an ideal world all the girls will jump at Felbridge next weekend before going to a show at Auvers in France, and then to the September show at Hickstead. However, I do know that planning too far ahead (10 days in this case) can be a mistake.